Cemetery research is often similar to an archaeological excavation both literally and figuratively. The events of the past week have helped to crystallize my thinking about the "digging deeper" metaphor. This is the cover page of the book that I purchased on Saturday. 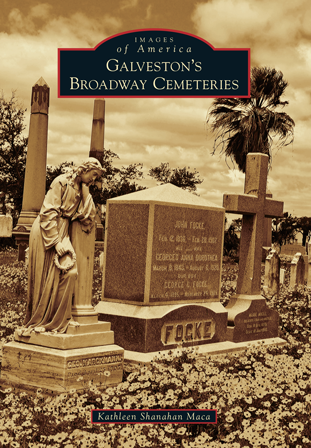 On Saturday, I attended a presentation about a new Images of America book entitled: Galveston's Broadway Cemeteries. The author of the book, Kathleen Shanahan Maca has been researching genealogies and cemeteries for over 40 years. The cemetery on Broadway in Galveston is actually seven separate cemeteries that date back to 1839. The stories Kathleen told and the images shown were both poignant and amazing. Most of us have heard about the seawall in Galveston that was constructed after the 1900 hurricane to protect the island from future storms. Many structures that were previously five to six feet above sea level were also raised after the 1900 storm to heights of eight to 22 feet. Kathleen surprised me when she said that the Galveston burial grounds were also elevated three times between 1918 and 1925. If cemetery lot owners declined the opportunity to assist in these cemetery raising projects, then their cemetery lots could be resold leading to as many as three levels of interments in the Galveston cemeteries. Many of the early cemetery markers were buried and many of the mausoleums were left with only their roofs exposed. Only an estimated 25 percent of the markers in the Broadway cemeteries have been raised. Volunteer "digs" at Galveston cemeteries reveal wrought iron fences and original markers that were buried in the process of raising the grade level of the cemeteries. Some of the plots in the Broadway cemeteries may appear to be an archaeological dig. Houston, TX 77059 (Clear Lake City).